Anyone who regularly passes through the Myrtle-Broadway zone, which has become a hotspot for illegal activity set against a background of infrastructural decay, will recognize the smell of K2 which seems to permanently hang over the busy intersection. The area was also the focus of Council Member Antonio Reynoso’s “cleanup” effort last October, which he touted as an “interagency intervention” partly aimed at stopping the sale and use of K2. 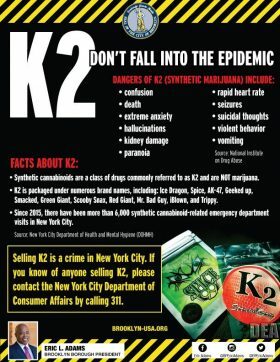 Even then, K2-related illnesses and incidents of overdose were alarmingly high– in 2015, there were more than 6,000 emergency room visits attributed to K2, according to the city Department of Health. Adams repeatedly emphasized the importance of acting quickly to stop the spread and sale of the drug to prevent another crack epidemic. Assembly Member Maritza Davila, who was also in attendance at the press conference, spoke about her own experiences growing up in the neighborhood. “I saw what drugs did in the ’70s, ’80s, and ’90s,” she said. “This is completely unacceptable.” She called K2 “a poison” that’s “being packaged as though it was candy” and sold at corner stores in the immediate area. “It’s completely insane,” she added. All of this inspired BP Eric Adams to call an emergency press conference as a means of reaching out to the community. “It’s a citizen problem too,” he told the crowd, urging parents and teachers to rifle through backpacks, bodega owners not to sell K2 (often absurdly marketed as plant food, incense, even potpourri), and community members to keep an eye out in general, and report businesses selling the drug. “I’m going to do my part as an elected official, but you have to do yours too,” he said. While officials are kicking into high gear, the Borough President emphasized the importance of community participation, and used the press conference as an opportunity to launch a canvasing effort. 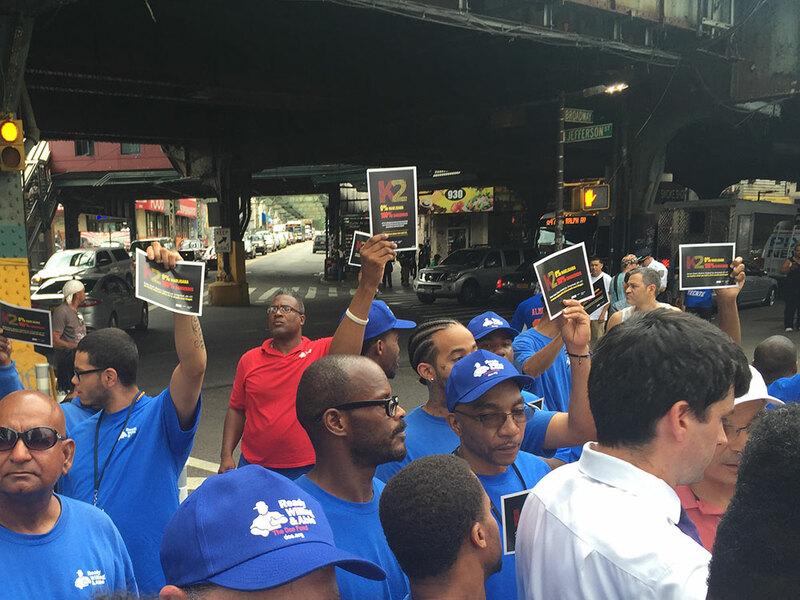 As the elected officials spoke, a crew of strapping young men and a bunch of “men in blue” from The Doe Fund stood in the background, holding up flyers that warned K2 “is NOT marijuana.” The flyer also listed brand names of the substance (the most hilarious ones among them: Scooby Snax, Mr. Bad Guy, and iBlown) and possible effects including kidney damage, seizure, violent behavior, and death. During question time, a reporter asked if the recent spike in the K2 crisis has led Adams to second-guess the 2014 decision to effectively decriminalize the possession of small amounts of marijuana. Adams adamantly opposed this assessment, arguing that his position in support of the move to relax possession enforcement still stands. 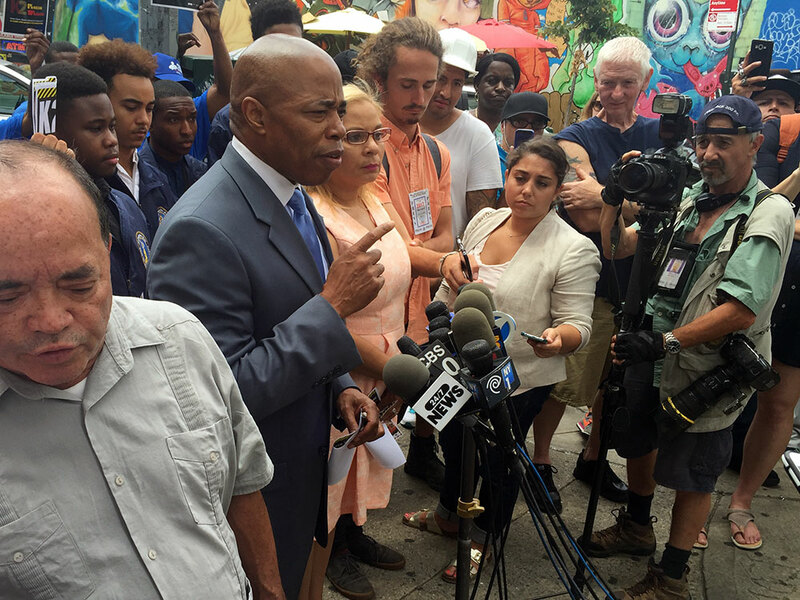 “We don’t want to criminalize our young people,” he said.